Hallowed Histories are delighted to kick off their 2018 film season with the 1971 folk horror classic, 'Blood on Satan's Claw' as well as a new short film about the legendary demon dog of Norfolk, 'Black Shuck'. Set deep in the Norfolk countryside, Piers Haggard's 'The Blood on Satan's Claw' is a gruesome, suspenseful shocker that shows what happens when an entire village is possessed by evil forces. Starring Patrick Wymark (The League of Gentlemen, Witchfinder General) as the crusading Judge and Linda Hayden (Vampire, Taste the Blood of Dracula) as the most alluring of the devil's disciples. A favourite amongst cult horror fans, including actors Mark Gattiss and Reece Sheersmith, and horror writers Jeremy Dyson and Mark Morris. Before the screening there will be a brief introduction by genre expert James Brown of UEA. 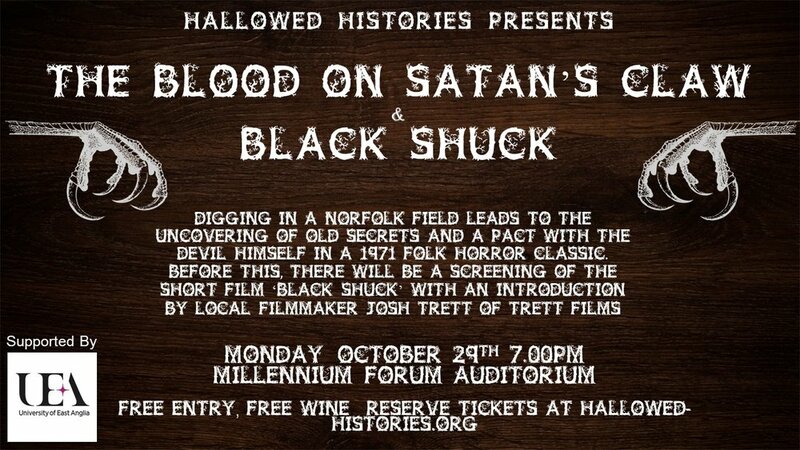 Paired with this will be 'Black Shuck', a new film by local filmmaker Josh Trett of the award-winning Trett Films. This fascinating short details what happens when ancient folklore crashes in on the life of a disturbed young woman (Holby City's Rebecca Grant). Josh Trett will be on hand to introduce the film and answer and questions.